We provide a 2 year warranty on our installation work. 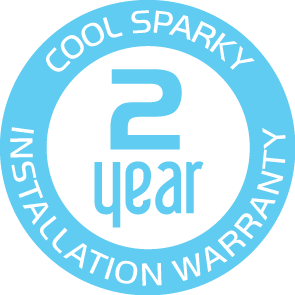 Mundaring’s Cool Sparky are licensed installers and complete all necessary documents to validate your warranty. The products we supply have warranty as provided by the supplier. Just keep these details with your invoice. If a product is faulty we are happy to help you initiate the warranty claim. While many installers have only completed a five and a half day air conditioning certificate course, Cool Sparky’s fully qualified staff have been apprenticed for six years. You must ask your prospective tradesman if they are fully qualified refrigeration mechanics (sight photo ID refrigerant air conditioning ‘RAC’ licence) and if they provide an installation warranty. “a product warranty will be void if damaged or repairs are required as a consequence of faulty installation”. “if damaged or the need for repairs resulting from any improper maintenance or the use of unapproved refrigerant types”. “Normal maintenance as described in the installation and operation manual, such as cleaning of the coils, filter cleaning and/or replacement, and lubrication must be undertaken so as not to void your warranty”. Routine checks, repairs, and maintenance of air conditioners help you save a lot of time, money, and inconvenience.